The hall was built on the site of a tannery in 1889. A meeting chaired by Mr Farnham agreed that the best way forward to achieve a village hall was to set up a company consisting of shareholders with a subscribed capital to provide the cost. By September of 1889, a list of 46 shareholders had been drawn up. In 1891 a skittle-alley was added and tennis courts in 1892. In 1892 the back room was let as a private school to Miss Emma Jacques of Mountsorrel. In 1897 the hall was used as temporary accommodation for pupils of Rawlins School which was then being built. During World War 1 wounded soldiers were entertained in the hall. 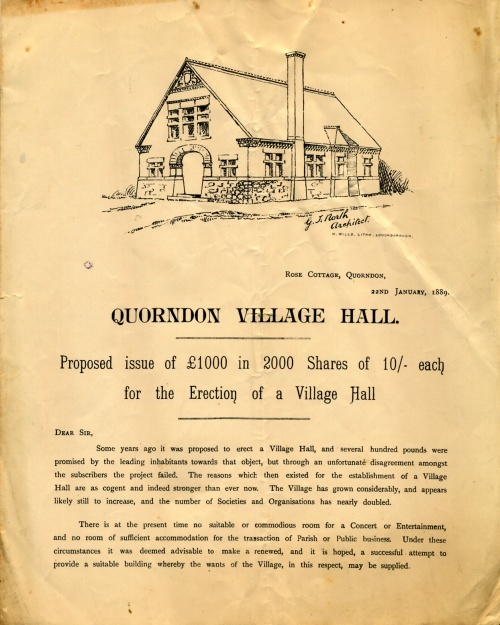 The company was wound up in 1911-12 when the shareholders gave up their interest in the property and it was conveyed to the Quorn Urban District Council.